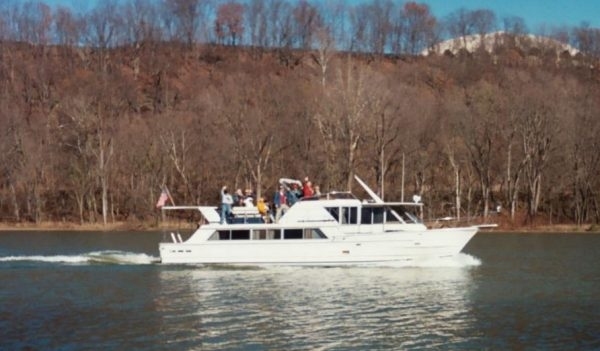 The Enchantress, a 52-foot Coastal Cruiser, is docked at Star City, WV. She is owned by Tom and Barabar Bartlett. Tom graduated from WVU with a degree in Chemical Engineering, then worked for the US Army in Maryland. After retiring he returned to his home town of Grafton, WV, and is now the town's Mayor. The Bartlets bought The Enchantress while living in Maryland and cruised hundreds of miles of the Altantic coast in her before having her hauled to the Monongahela. Tom is an active member of the US Coast Guard Auxiliary, and The Enchantress is used for UACG safety patrols. Tom conducts the annual UMRA river tour for local persons of influence. 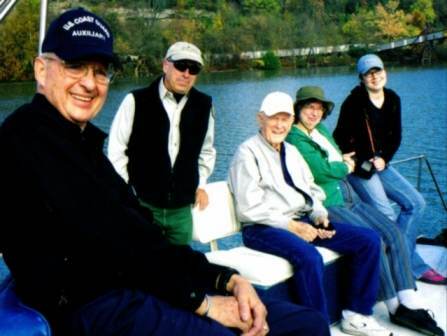 Captain Tom is on the left in the river trip photo below.